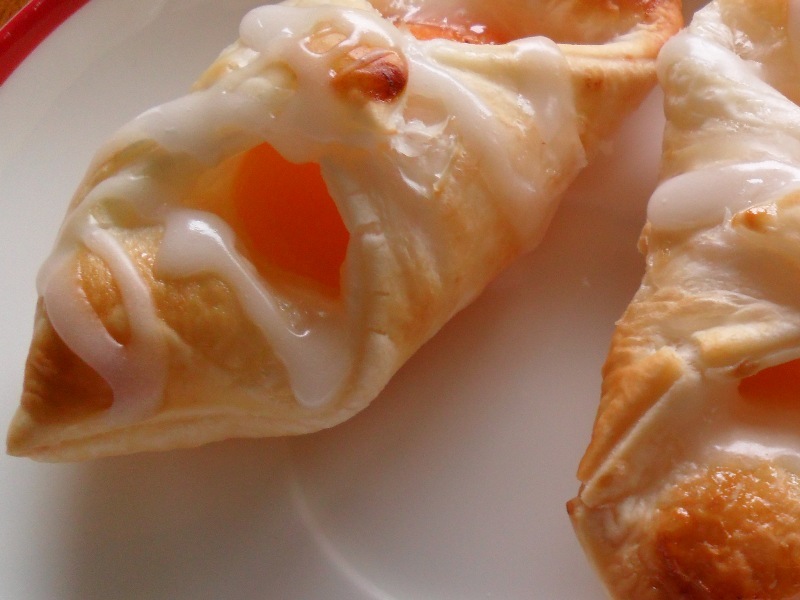 Time saver: mini apricot danishes, just like regular apricot danishes, only smaller. Here’s a treat you can put together pretty quickly. 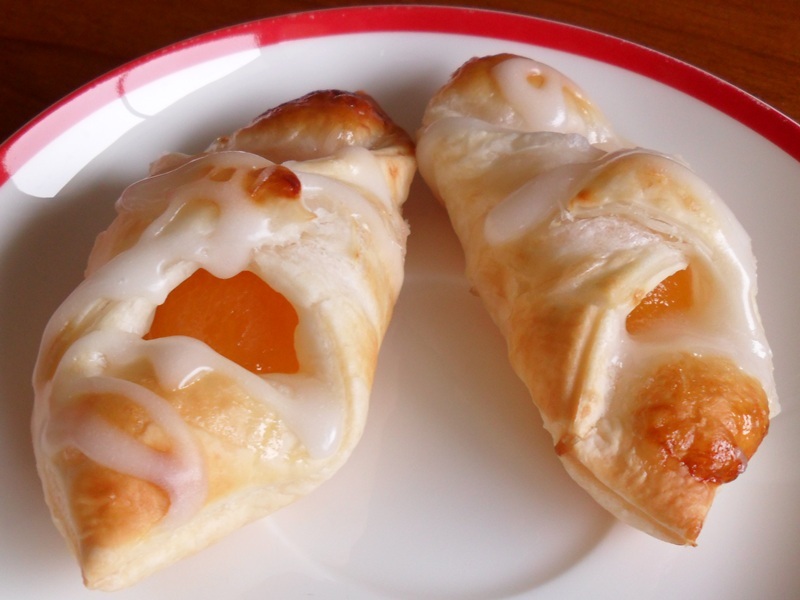 Tasty little parcels of pastry and apricot with a sweet glaze to finish it off. Good for a light breakfast/brunch, or just whenever you feel like it. Pre-heat oven to 200°C on fan-bake. Cut each pastry sheet into 9 even sized squares (i.e. 3 x 3 grid). Place an apricot half (cut-side down) into middle of each square. Fold up two of the corners of each square so they wrap around the apricot and overlap in the middle. Use a little apricot syrup to wet the pastry where it joins, then press down firmly. Place danishes on a sheet of baking paper on a baking tray. For a good finish to the pastry, prepare an egg wash by beating together an egg with a tablespoon of water and brushing lightly over the pastry on each danish. Bake danishes in oven for around 15 minutes, until pastry is golden brown, then remove from oven and transfer to cooling rack. In review of last year: 2011 saw the dawning of a new era of cookery, with the birth of philcooks. For anyone who’s interested, there were 2,668 views of the blog from its inception in July through to December, and I put up 32 posts with around 26 recipes. July was the most visited month so far, followed by December. Hopefully the blog’s been useful to someone. So what does 2012 mean for philcooks? Well, I reckon I’ll keep posting recipes for the things I’m making, and I reckon you can keep saying “Oh yes, very nice Phil” and then not cooking them, and we’ll get along swimmingly. I also plan (well, as much as I ever plan anything) to brush up the Facebook page a bit. That way you can opt in to being my friend without opting in to being spammed, or vice versa. I’m also open to the idea of a bit of a redesign, and rearranging things to make recipes a little easier to find. It’s a bit late to wish you a tasty Christmas, but here’s to a delicious New Year. I wish you all the best in all your endeavours, and happy cooking. p.s. if you have a tablet/iPad and you haven’t checked out the blog on it yet, you should, it looks great.